My friend Monika in Ann Arbor, Mich., sent me this picture today. 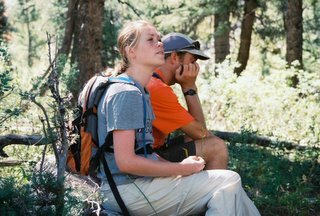 She took this photo of me and Geoff in late August in the Salt River Range of western Wyoming. Several of us had converged from our various corners of the country (me, Idaho; Geoff, Alaska; Monika, New York; and Chris, Utah) in this remote national forest along the Grays River to camp, hike and reminise about life before dispersal. I enjoyed seeing the photo because I figure it was taken about two days before I found out I had a job offer in Homer, Alaska. At the time I was still heavily conflicted about the prospect of moving to Alaska. It was a vague plan Geoff and I had for a while. But after he left in the early summer I grew more comfortable with my life in Idaho, and more leary of the unknown north. Employment was scarce, distances extreme and, if I suddenly found myself single, as my ex-boss in Idaho put it, "The odds are good, but the goods are odd." After the trip ended, Monika made her move from New York to Michigan; Chris took a different job in Utah; and Geoff set down the final ultimatum - he was going back to Alaska, with our without me. That same day, the day this camping trip ended, I got the e-mail from my current employer - a job offer. "So how do you feel about living in a town called Homer?" the e-mail began. And my first thought was - fine, really. Two weeks later, I returned from my last spin class, stuck my last midnight shift at the copy desk, and hit Interstate 15. I had been so conflicted, but somehow this transition fell so perfectly into place that it was like merging onto a winding interchange only to look over at the end and find you're still parallel with the highway. Something like that ... but I think, now that I look at this photo, maybe I knew that all along.